This rather odd property marker is in a garden wall on the outskirts of Chichester in West Sussex. The stone faces out, annexing 6½ inches (16.5 cm) of what is now a grass verge next to a pavement. 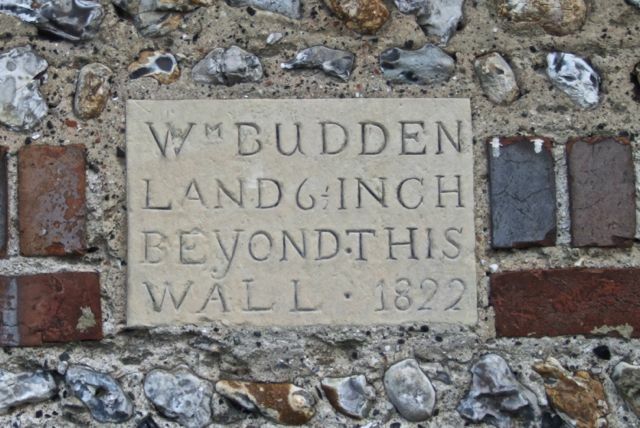 We will probably never know exactly why William Budden felt the need to lay claim to this tiny portion of land, though maybe his builder made some mistake when he pegged out the building plot. There is nothing new about a person or organisation marking their territory, of course. Many animals do it to defend their feeding and breeding areas, so this kind of territoriality must have its origins deep in our evolutionary past. The first fixed boundaries perhaps started with the invention of farming in the Neolithic era, thousands of years ago. Since that time, real or figurative lines have been used to delineate everything from homes and gardens to international borders. Not a lot seems to be known about William Budden, though he was obviously a man of property. The site itself is now in Chichester, but was once within the parish of Oving. One of the curious things about the boundary stone is its date – 1822. Date stones are normally erected to commemorate construction work or the acquisition of a piece of land. The problem with the 1822 date here is that it is on a property that does not seem to have existed until 1825 or 1826. The Land Tax records for Oving parish first show Budden as a property owner there in 1826, not before. He owned five houses and a piece of land in 1826, adding another house by 1829. In that year he was occupying two of the houses himself, using one of them as a shop. It is not at all clear why Budden wanted to suggest that his property rights there pre-dated the actual purchase by three or four years, though the original deeds might clear the matter up, if they still exist. The 1838 Tithe Map for Oving shows the Budden property as a compact plot of land with four sides, which can still be traced on the ground (1). Property boundaries can endure for a very long time. ‘Good fences make good neighbours’ says the old proverb. Would William Budden have made a good neighbour? I’d doubt it. The pernickety nature of the claim – what use could he make of an extra half inch? – suggests a man who was jealous of his property. It’s the sort of thing you would expect from Ebenezer Scrooge! Boundaries can make many of us feel safer, but it’s in the nature of dividing lines to exclude others. Are they a good thing or a bad thing? It depends which side of the fence you’re on. (1) Oving Land Tax: West Sussex Record Office (WSRO) QDE/2/1; Oving Tithe Map: WSRO TD/W93; parish rate books are also a good source for property history, but unfortunately those for Oving don’t seem to survive for this period.